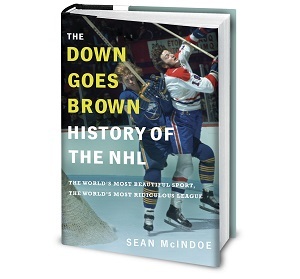 It's been a few weeks since I shared the exciting news about The Best Of Down Goes Brown. In that time I've had several people send me questions, and had a few more updates from the people in charge. So with just a few days left before the book becomes officially available, this seems like a good time for an update. Wait, what? You have a book? Yes. You can find out all about it here, or just keep reading since I'm going into third-person spam mode starting... now. Wow, that sounds awesome! Where can I buy it? Thank you, fictional question-asker who sounds sincere and not like shameless marketing at all! You can pre-order the paperback version today from sites like Amazon.com, Amazon.ca, Barnes & Noble, Chapters/Indigo, or directly from Wiley. It should also be available in bookstores throughout North America, although it will probably be easier to find in hockey markets. If you're outside North America, check your local online store – many of them seem to be stocking it. I haven't bought an actual book since the 1990s. What about an ebook version? This was the question I heard most often over the last month, so I'm happy to confirm that there will be various ebook options. I'm told that there will be versions available for the Kindle (Amazon) and the Kobo (Indigo), as well as an ePDF available directly from the publisher. These versions should be appearing on the sites shortly, perhaps before the print version ships. In fact, Amazon.com appears to have their Kindle version available already and the Apple iBook version is available too. My guess is the other ebooks will start coming online fairly soon. And I'm told the book is also listed as coming to Google Play in September. I pre-ordered the book from an online store. When will it ship? The book is being printed pretty much any day now, and will be sent to the resellers shortly. It should start shipping from online stores shortly after, as well as appearing in local bookstores once they have time to shelve their new titles. I keep getting emails from (insert online bookstore here) that say the release date has changed. Ignore those. One of the things I'm learning through all of this is that pre-order ship dates are often basically guesses, and as time goes on they get updated often with newer, less accurate guesses. The book should ship early September-ish or maybe sooner, and that's pretty much as specific as anyone seems to be able to get. Do you make more money based on what version or where people buy it from? Not really. It varies slightly but not enough to make a difference, so please buy whatever you want from whoever you want. Can I get an autographed copy? I will totally sign your book if you run into me in a bar and/or mail your copy to me. However, be warned that I haven't hand-written anything legibly since I first got the internet in 1995, so you could achieve the same effect yourself by just taking a sharpie and scribbling all over the front page. Hey wait, are you going to turn into one of those people who clogs my Twitter feed with annoying retweets of positive reviews from random people all day? Probably. Sorry about that in advance. Which posts are included? What's the new stuff? Here's a full list of chapters. The new stuff is bolded. 6. Take the Quiz: Do You Have a Concussion? 27. Take the Quiz: How Will Your Team Do this Year? 38. Take the Quiz: Should You Rebuild? 52. Take the Quiz: Was that a Dive? I have a short attention span. Remind me again where I can buy this? Thanks again, ficitonal question-asker who's actually starting to get kind of pushy. Order today from sites like Amazon.com, Amazon.ca, Barnes & Noble, Chapters/Indigo, or directly from Wiley. OK, I read the book. Now what? If you've read the book and enjoyed it, probably the single biggest way you could help spread the word is by writing a review on one of the major sites. For a relatively unknown author without much marketing budget, a positive review on a major site is priceless. So if you'd like to help spread the word about this book, please take a few minutes to add a review to your favourite book site. Oh god I might have to take a day off work... can't. put. it. down. This column isn't as funny as it usually is... DGB must be in a slump..must be the slow time of year between Tim Thomas rants and Donald Fehr/ Gary Bettman handshakes at Christmas to kick off the 2012 /2013 season. You need your day ruined to drink too much? Is Osaka a hockey market? on the list of 10 best coaches, is Paul Maurice #4 or #5? Need to know before I buy the book. Thanks! He is both #4 and #5. I understand why, but its kind of a shame none of the Wendal Clark stuff is in there. I'm not a Maple Leafs fan (go caps go) but I'm Clark fan because of this blog. I am entirely too excited for this book. How many Wade Redden jokes are there in this book? This is need-to-know information. Thanks! Just one, but it's 212 pages long and ends with Redden saying "The Aristocrats!" Hm, so this is odd. I preordered my copy in July, and I kind of remember that there was some weirdness with the release date at Amazon (US) around then. Did they never fix that? Because they still have it listed as coming out at the end of October, and I should supposedly have my copy by November 1st. Which, if it's coming out within the week, is not at all cool. November is a million years away! Yeah, not sure what's up with Amazon in the US. People who pre-ordered from Amazon in Canada have already started receiving their copies so I can't see why there'd be much of a delay in the States. My best guess is that the status will switch over fairly soon and shipping will start, but who knows. Why would I pay for something that I can read for free on your blog + some stuff that's also found on your blog but carefully rearranged to appear like fresh material? I kid, I kid. The book is number one on my list of "things that I really want to purchase online while I'm bored at work but somehow slip my mind by the time I get home and become preoccupied with other stuff". I will get around to reading it. There better be at least 3 Pronger attacks or I'm out. Who is Sean McIndoe? I was hoping this book was written by a guy with Native Indian roots named Down Goes Brown. So does the book have the pictures and captions from the posts?